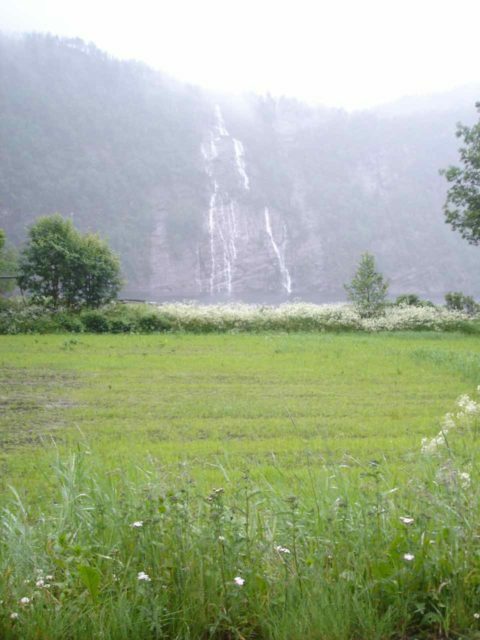 Both Kvernhusfossen and Geitaskardet were attractive waterfalls on opposite sides of the valley of Modalen (the Health Valley?) 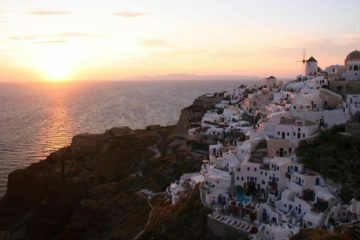 and the town of Mo (pronounced “MOO”). 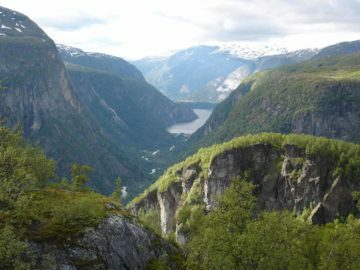 The town was situated right at the headwaters of the Mo Fjord (Mofjorden) and the mouth of the Mo Valley. When we visited on a rainy late afternoon in June 2005, the town was seemingly isolated and quiet. Julie and I only made a brief visit here as it was getting very late in the day (we showed up at about 9:50pm but there was still plenty of late afternoon daylight). That said, if it wasn’t for the bad weather, we could totally envision this place being one of the most hauntingly beautiful spots in the country! 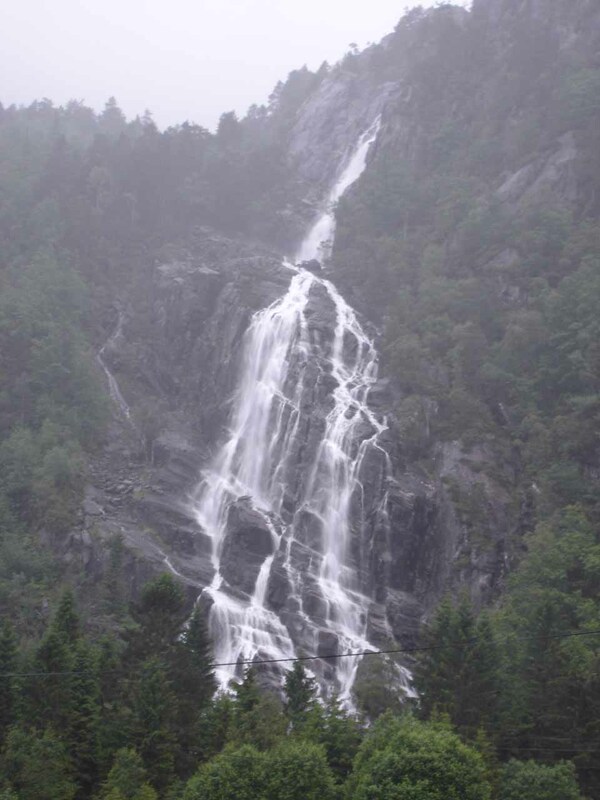 Anyhow, the most conspicuous waterfall in the valley was Kvernhusfossen, which twisted its way down a cumulative height of 230m as it fanned out down the northern wall of Modalen. The falls was easily seen throughout the valley so we drove to numerous spots trying to take photos from a variety of different angles as well as complementing the waterfall with a variety of photo subjects. 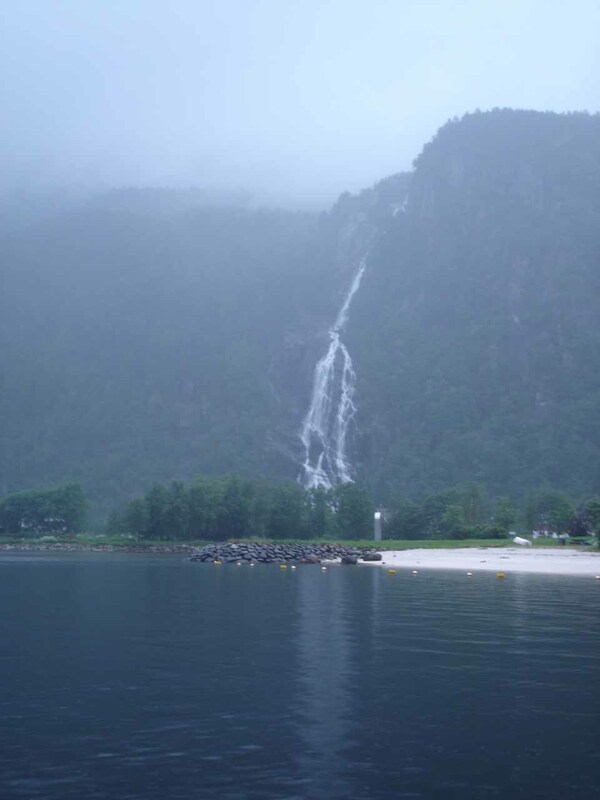 Being fed from a pair of lakes called Nedstavatnet and Øvstavatnet, we suspect the waterfall would flow well for most of the year (if not all year round). After getting our fill of Kvernhusfossen, we were about to leave Modalen before we noticed a series of strandy waterfalls tumbling down the southern cliff walls steeply dropping into the head of Mofjorden. 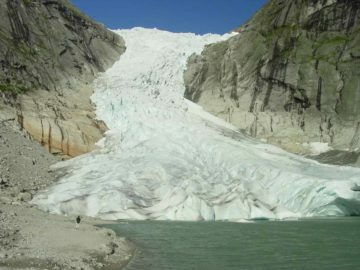 According to the maps, the waterfall was known as Geitaskardet (“GYE-ta-skar-duh”; the name I think might have something to do with goats since geit means “goat” according to my Norwegian dictionary). This set of waterfalls didn’t seem like it would last for very long without rain. 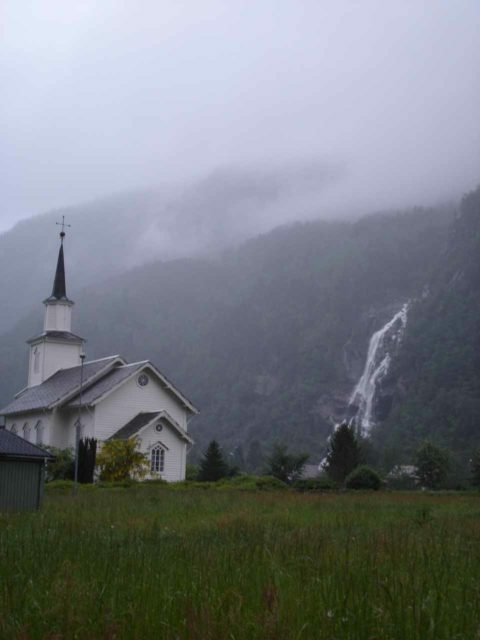 However, since it was raining during our visit, it definitely was flowing in a way that roughly reminded us of how several waterfalls would tumble down like “veins” in the mountains of Fjordland in the South Island of New Zealand. 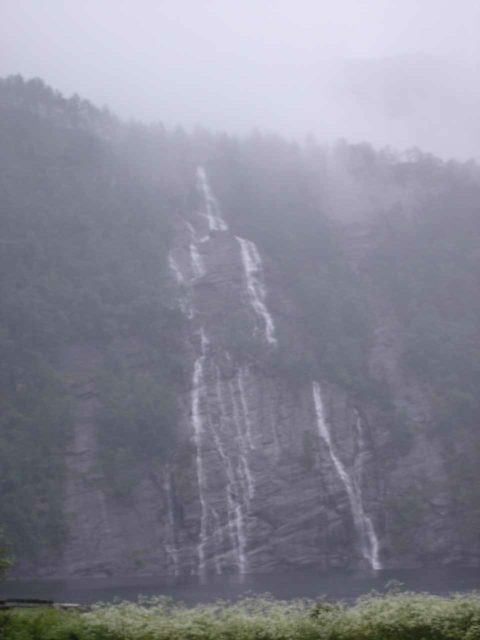 Finally, in our haste to get to our accommodation, which was still a couple of hours drive or so away from Modalen, we happened to miss yet another notable waterfall called Hellandsfossen. 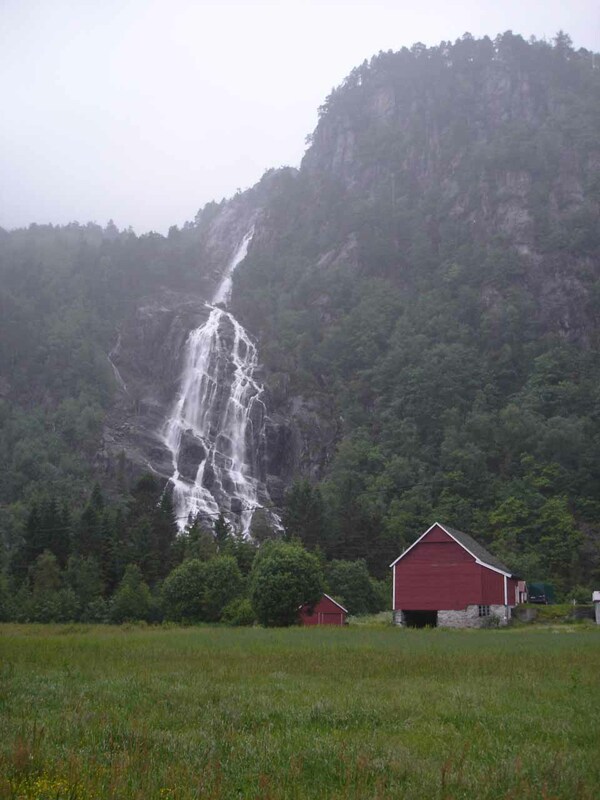 This was said to be a regulated 34m waterfall that was said to be home of the country’s largest salmon ladder. 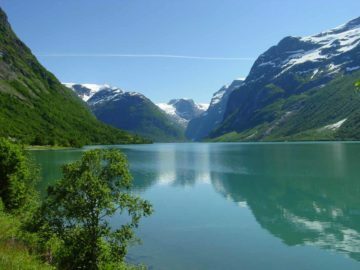 Kvernhusfossen and Geitaskardet reside in the Modalen Municipality. For information or inquiries about the area as well as current conditions, visit their website. Getting to Mo from the E16 required a lengthy drive (or at least it seemed that way as it was 33km) along Rv569, which was a scary stretch of road as most of it was narrow and nearly single-lane supporting bi-directional traffic. 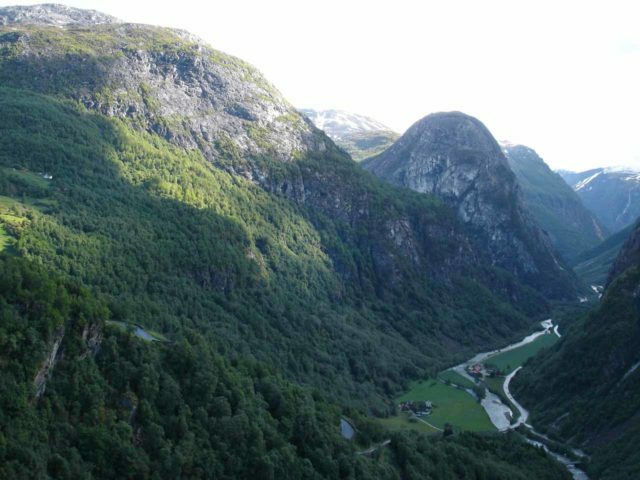 After passing by Hesjedalsfossen and the Stigfossen/Fjellfossen tandem, we then had to pass through the fairly spooky Modalentunnelen (28km from the E16) before emerging from the tunnel in the valley of Modalen itself. At that point, we turned left and headed to the town of Mo where both Kvernhusfossen and Geitaskardet were located. 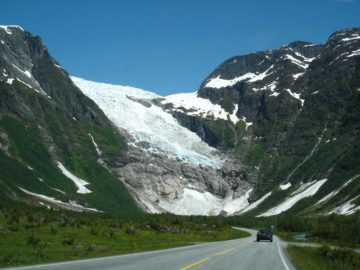 To give you an idea of the context and drive times, Mo was 99km (under 2 hours drive) northeast of Bergen by way of Osterdalen as described above. 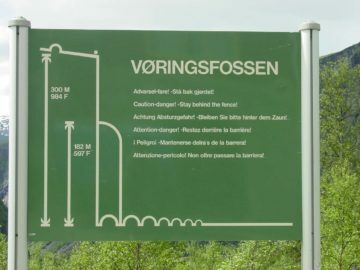 Mo was also 71km (nearly 90 minutes drive) northwest of Voss.